What do you think is the major cause of our misery and pain? It seems we’re always mad or frustrated about something: the rain, the snow, the neighbors, work, friends….., you know, it goes on and on. But really, how can weather, other people or anything else “out there” cause us to feel anything? Everything we experience is an interpretation, an opinion. Our mind attaches an emotional opinion of the event and feelings are then produced by that opinion. We then feel as if our feelings were caused by the event. If you let this go too far you could live a very frustrated and unhappy life. How can you end this seesaw of happy/angry, frustrated/accepting? It all comes down to contradiction. Contradiction of the ego. You want a clear, sunny day and it rains. You want to take a trip and your car breaks down. You wanted to spend time alone and friends knock on the door. You expect one thing but something else shows up. If you think about it the opportunities for frustration are constant. Every hour of every day brings you an opportunity to be frustrated. But on the flip side it also brings you the opportunity to step out of this never ending struggle and learn to accept what is. You actually have to train yourself to change or eliminate your opinions. Yes, train yourself. Reacting to circumstances is a very ingrained response that requires a bit of work to change. It starts with not defining anything. You learn to not define or attach meaning to anything. If it’s raining, accept rain. Do something else or go for a walk in the rain. In fact that is one way to begin the process of retraining your mind. My teacher Stuart Wilde would always recommend walking in the rain as a way to tell your ego mind you are in charge. The ego mind does not like to be cold or wet or uncomfortable. So make it uncomfortable! I always seek out water to jump into, usually very cold water. But I do it to remind my mind that I am in charge (it’s kind of crazy telling yourself that you are in charge but crucial). Another way to push back against your ego mind is to accept everything that is presented to you. Begin the practice of accepting what is presenting itself as much as possible. After a while it becomes automatic. If you are served a meal and it doesn’t taste great, so what? Eat the meal. Remind yourself that every meal is a gift. If you were starving would you criticize any food? Of course not. It is the height of arrogance to reject food. Once you realize that all frustration, anger, sadness or anything else comes from the mind’s opinion and the emotion attached to that opinion. Once you get that, you can change your opinion and begin to let it go. Accept what is. Don’t define, don’t judge, don’t criticize. By starting to accept more and push back less in your daily life you can begin to lift yourself up. 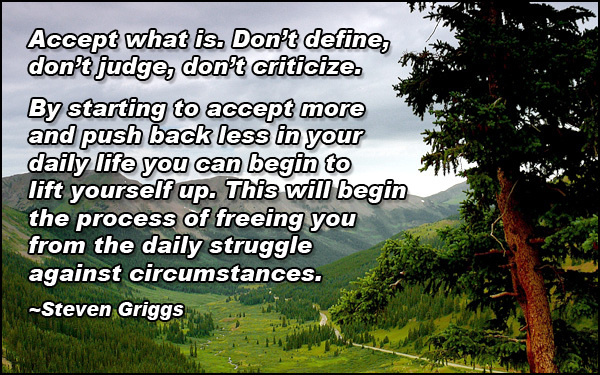 This will begin the process of freeing you from the daily struggle against circumstances. Relax, what it is, is what it is.